There’s no doubt in my mind that dogs have emotions. They feel joy after a job well done. They feel sad when a pack member passes away. And they feel love for their family members – their pack. However, it’s important to remember that those emotions are different from our own. The feelings that dogs experience aren’t connected to complex thoughts. They don’t have ulterior motives or doubt. Their emotions are pure and honest. Your dog isn’t lying to you when he communicates that he loves you. The more you fulfill your dog’s needs, the more this connection will develop between you. There’s nothing better than coming home from a bad day and having your dog there to support you. No judgment. No questions. Just love! But remember, how we feel affects our dogs. If you are upset after a long day of work, your dog won’t understand why, but he will pick up on your energy and body language. He will interpret this as unbalanced energy, and if you don’t have your leadership down pat, it can lead to behavior issues. Make sure you are fulfilling your dog’s needs first.Our dogs give us so much and ask so little. If we provide them with exercise, discipline, then affection, we can really appreciate man (or woman’s) best friend and the love they have to offer. 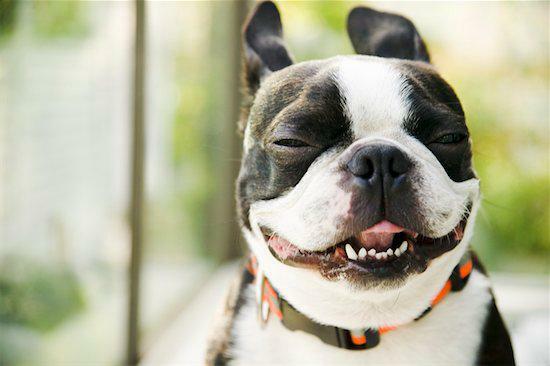 Are you convinced your dog laughs? Or maybe you think he feels ashamed when you discover that he’s peed on the carpet? Find out if you’re right – or if you might be humanizing your dog. Here’s a few thoughts on the science behind your dog’s feelings. Have you ever heard your dog’s panting during play and thought it sounded like a chuckle? Turns out, you might be right! Researcher Patricia Simonet from Sierra Nevada College discovered that certain breathing or excited exhalations could be the canine version of laughter. Her team brought a parabolic microphone to a park and, from a distance, recorded the sounds that dogs made while playing. They discovered a special exhalation that was different from normal panting. Later, the team played the sound for other dogs who started to play after hearing the “laugh.” They also discovered that it helped to calm shelter dogs who were under stress. Most dog owners are familiar with the telltale signs that indicate their dog has been “up to no good” while they’ve been away: the lowered head, ears swept back, the hunched posture, and a doleful gaze. Even if the fruits of the dog’s bad behavior are not immediately apparent, his body language seems to point to feelings of guilt. But for dogs, the emotion is slightly less complicated than human guilt or shame. Your dog’s submissive postures are the result of anxious anticipation; an expected disciplinary action. It may have been your reaction to similar behavior in the past, or it may be the change in your energy and body language when you discover his actions in the present. Your immediate reaction in any disciplinary situation creates an association for your dog, he now knows that his actions will lead to discipline or punishment. Dogs don’t grieve in the same way that humans do, but they do experience sadness when a pack member passes away. If your family experiences a loss, your dog may react by displaying signs of distress: loss of appetite, fear, depression, sleeping too much or too little, and anxiety. In 1996, the American Society for the Prevention of Cruelty to Animals conducted a Companion Animal Mourning Project which found that 66% of dogs exhibited four or more behavioral changes after losing a pet companion. Give your pet time to cope with the loss. The study found that most dogs returned to normal after two weeks but some took as long as six months. You can help by maintaining their routine and going through your own grief. Your dog will have trouble moving on if you are unable to. If you are afraid these symptoms may be the result of illness, take your dog to the vet.